Chloroplast DNA nucleotide sequences provided the first molecular evidence bearing on the origin and relationships of the Hawaiian silversword alliance. These data support the conclusion that the Hawaiian silversword alliance is a monophyletic group derived from ancestors very similar to the extant Pacific coast tarweeds Anisocarpus scabridus (Eastwood) B. G. Baldwin [Raillardiopsis scabrida (Eastw.) Rydberg], Kyhosia bolanderi (A. Gray) B. G. Baldwin [Madia bolanderi (A. Gray) A. 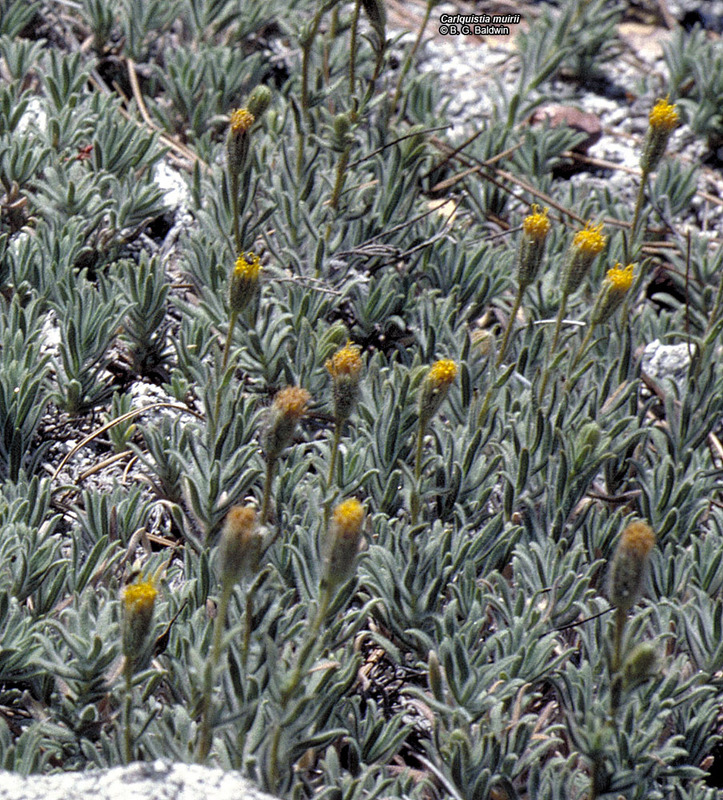 Gray], and Carlquistia muirii (A. Gray) B. G. Baldwin [Raillardiopsis muirii (A. Gray) Rydberg]. Carlquistia muirii is a rhizomatous, mat-forming plant with herbaceous stems 2-3 dm tall that bear mostly alternate leaves measuring 1--3 cm long by 1.5--4 mm wide. 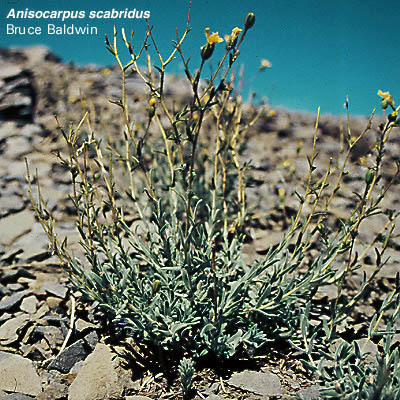 The species occurs only in the southern Sierra Nevada and Santa Lucia Range of California, on open granitic slopes at elevations of 1,100--2,500 m. The chromosome number is 2n = 16. Anisocarpus scabridus, California, Lake County, ridge E of Hull Mt. summit. The chromosome number is 2n = 14. Kyhosia bolanderi has fleshy rootstocks that bear herbaceous stems 5--12 dm tall. The linear leaves are clustered and opposite toward the base, sparse and alternate above. The heads are large and radiate. The species occurs in the Sierra Nevada and mountain ranges of northern California and adjacent Oregon, in meadows and on stream banks at elevations 1,100--2,600 m. The chromosome number is 2n = 12. 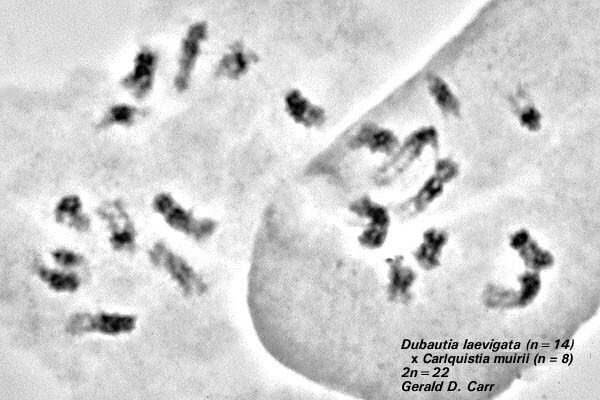 The molecular data encouraged an attempt to artificially hybridize Dubautia laevigata, and Carlquistia muirii. The cross was very successful, and soon several vigorous intergeneric, trans-Pacific hybrids were in cultivation. 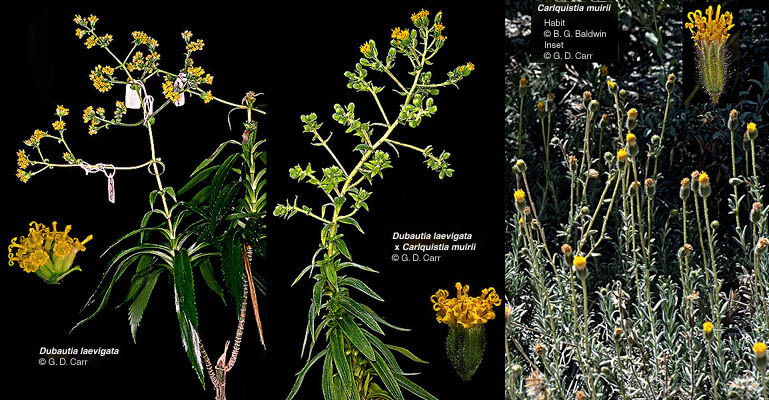 The female parent, Dubautia laevigata is in the upper left, the male parent, Carlquistia muirii, on the right, and the intergeneric hybrid is in the center. 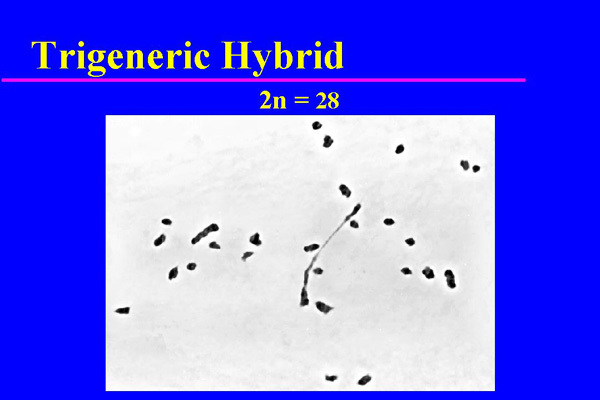 The middle illustration shows 22 chromosomes in a somatic cell of an individual of this hybrid combination. The lower illustration shows two cells at meiotic metaphase I. The cell on the left has 22 unpaired chromosomes while the cell on the right has 16 unpaired chromosomes and 3 apparent bivalents. The arrows indicate two partially overlapping univalents. Almost a third of the microsporocytes underwent a mitotic division at a time when reductional division was expected. About 45% of the cells observed had 1--3 pairs of chromosomes. 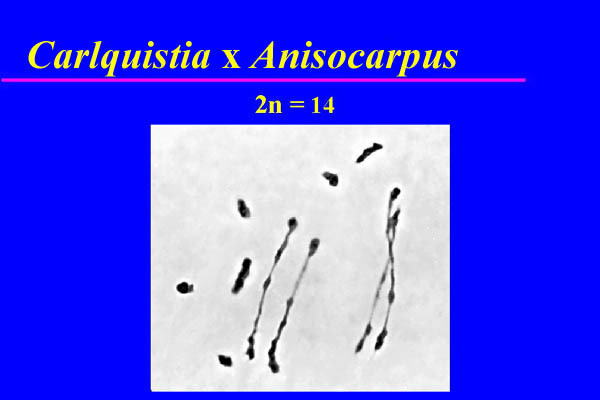 The maximum number of pairs of chromosomes observed (4) was seen in only one cell (0.3%). Pollen stainability in this hybrid was 49.3 %. Nearly all of the stained grains were tetracolporate (compared to normal tricolporate grains), and were larger than normal, indicating their probable diploid condition. 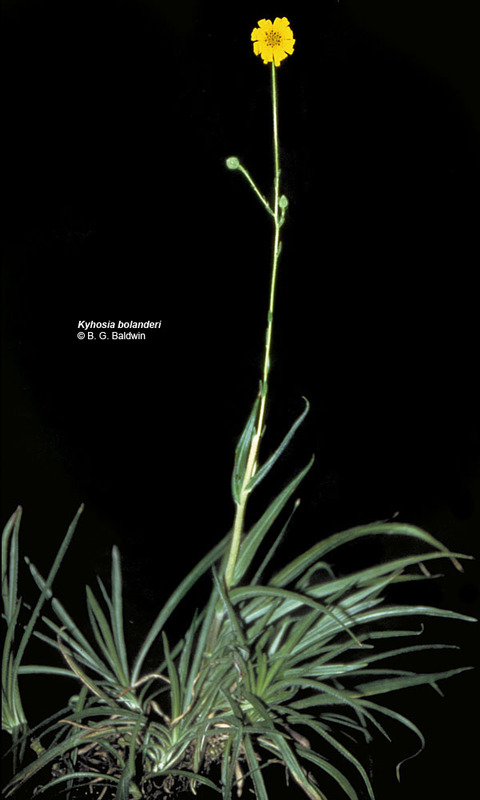 Artificial hybridization of Dubautia with Kyhosia bolanderi also proved easy to accomplish. The upper illustration shows the female parent on the left, which was itself a fully fertile hybrid between Dubautia knudsenii and D. laxa. On the right is the male parent, Kyhosia bolanderi, and in the center, the intergeneric hybrid. The hybrid was vigorous, and as expected, exhibited 2n = 20 chromosomes. The cell on the left of the lower illustration shows 20 unpaired chromosomes. 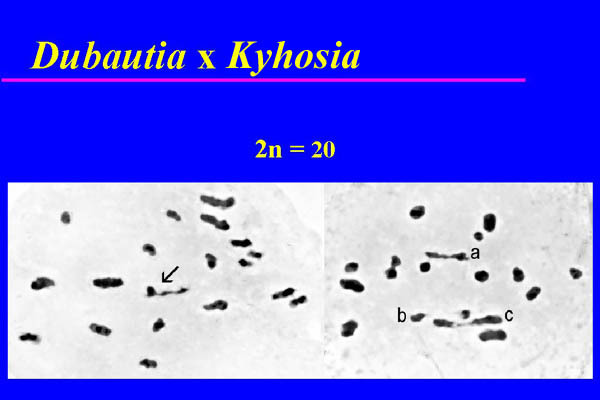 The 6 largest chromosomes are from Kyhosia while the remaining 14 smaller chromosomes are from Dubautia. An arrow indicates two contiguous univalents, one somewhat distorted. 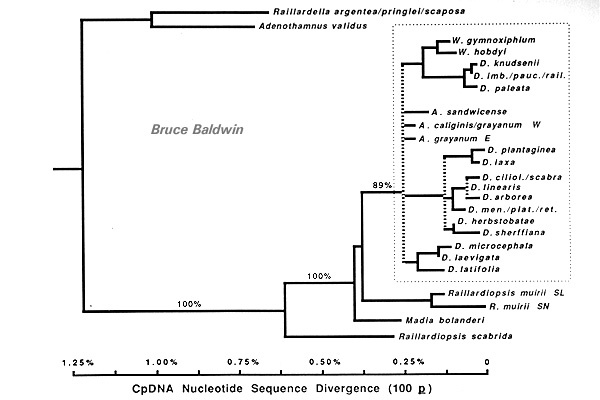 The cell on the right shows 3 apparent bivalents, a,b, and c. Considering the size of the chromosomes, the bivalents labeled a and b appear to represent infragenomic pairing of Dubautia chromosomes. Although about 80% of the microsporocytes had from 1--4 bivalents, the chromosome associations appeared to be looser than in the previous hybrid combination. Pollen stainability was about 4.4% in this hybrid. Given that Kyhosia bolanderi (n = 6) and Carlquistia muirii (n = 8) each produce vigorous artificial hybrids with Dubautia (n = 14), it is tempting to speculate that the genome of the Hawaiian silversword alliance arose through hybridization of such diploid species followed by chromosome doubling (i.e., allopolyploidy). The upper illustration on the left summarizes this hypothetical scheme. 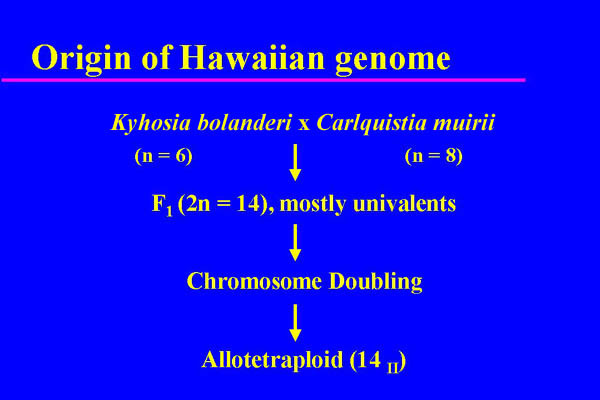 The diploid hybrid between Kyhosia bolanderi and Carlquistia muirii that could represent the synthesis of the Hawaiian genome has been produced artificially. The parental species are illustrated in the figures above while the intergeneric hybrid appears at the upper right in the next entry. The bottom illustration on the left shows a microsporocyte from this hybrid at meiotic metaphase I with 8 unpaired chromosomes and 4 bivalents. Microsporocytes from this hybrid commonly underwent a mitotic division at the time when reductional division was expected. This resulted in as high as 40% stainable pollen grains that were tetracolporate, larger than normal, and presumably diploid. These grains proved to be functional in the production of the trigeneric hybrid described below. In a continuing attempt to assess chromosome pairing and the genetic compatibility of these genomes, pollen from the artificial hybrid between Kyhosia bolanderi and Carlquistia muirii (top right) was transferred to stigmas of Dubautia scabra (top left). Amazingly, the first attempt resulted in three vigorous individuals of a spectacular trigeneric hybrid (top center) that combines the diploid genomes of two mainland genera with the tetraploid genome of the Hawaiian silversword alliance. This hybrid had low chromosome pairing with about 80% of the microsporocytes showing 1--4 pairs in addition to unpaired chromosomes. The cell illustrated (left, below) has one pair and 26 univalents. 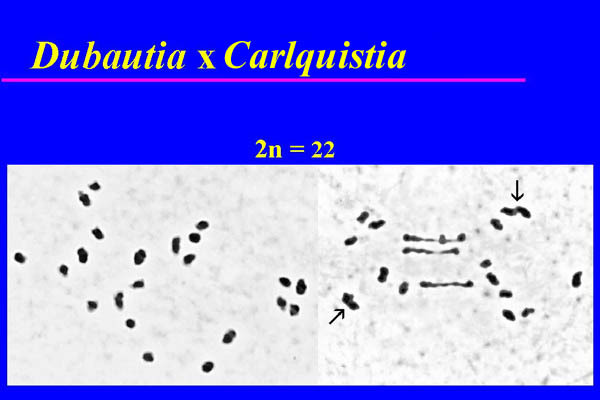 The largest chromosomes are from Kyhosia, the intermediate-sized ones from Carlquistia, and smallest ones from Dubautia. The remaining cells had all univalents or underwent mitosis at the time reductional division was expected. About 11.5% of the pollen grains were stainable and these were mostly tetracolporate and larger than normal. The low chromosome pairing in this hybrid is not surprising considering the low amount of pairing in the primary hybrids and given the fact that both the mainland tarweeds and the members of the Hawaiian silversword alliance have been undergoing rapid, independent chromosome evolution during the estimated 6 million years of separation of these groups. The molecular evidence linking Anisocarpus scabridus (n = 7) to the Hawaiian silversword alliance suggests another alternative to the allotetraploid origin of the Hawaiian genome outlined above. 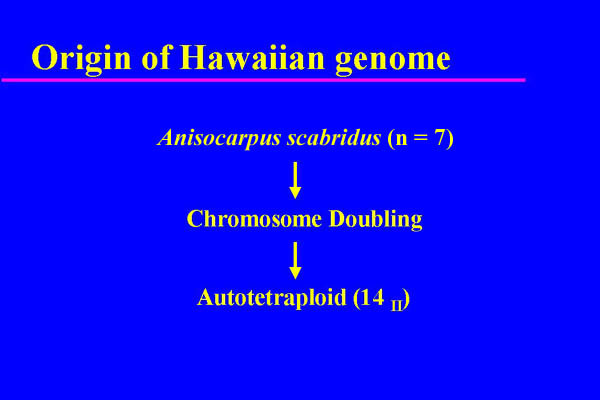 In this scenario the Hawaiian genome (n = 14) could have originated directly by autopolyploidy from such a diploid ancestor (illustration at left). 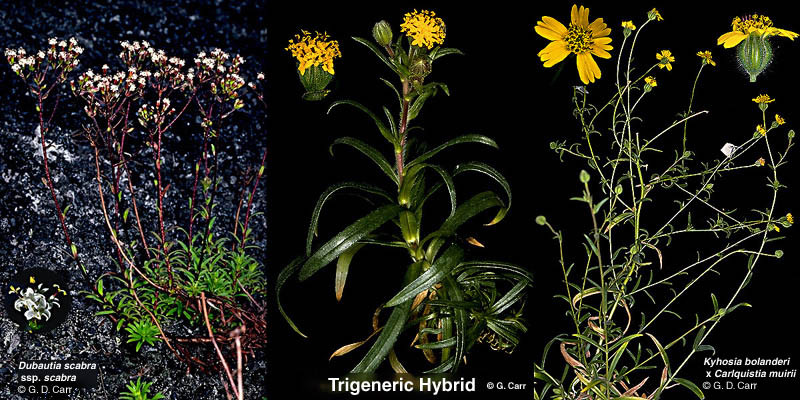 The artificial hybrid between Dubautia and Anisocarpus scabridus that may have helped to assess this hypothetical origin of the Hawaiian genome was successfully produced but was not vigorous and died before reaching reproductive maturity.